Silken Moon and *PosESioN* will begin the work to remodel their stores soon! PosESioN is having a liquidation sale on some of the older sets. They are priced to move at 90% off…WHAT A SALE!!! After this week he will remove, forever, some of the older sets, so grab them while you can at these phenomenal prices!!! The sale is for this week only! Remember these prices are for this week only!!! After this week, these poses will be gone forever!!! RAZMATAZ has created a set of 6 fantastic artistically styled Burlesque Poses for The 24! This limited edition set also includes 2 feathers and you can use these amazing poses without the feather, as well. I am using pose number 5. Awesome looking isn’t it!!! The 24 starts August 23rd and ends August 31st…see you there!!! Image Essentials is proud to be part of the August round at the Thrift Shop with the LOVE Couch. This current round will end August 31st. This amazing mesh couch is a couple’s couch that spells out LOVE! It has 8 fantastic adjustable couple poses which are Chat, Summer, Entwine, Revel, Engage, Home, Admire, and Beside! The very talented Kay Weston, of Image Essentials, has done the entire alphabet in mesh and if you want a different word, you have only to contact her directly for assistance with any word you wish! Awesome huh…just think of the possibilities!!! The LOVE Couch is waiting at the Thrift Shop for you! Show your love, by buying the LOVE Couch! Our first picture, above, features a adorable and romantic design named Splatt Sparking Chair by Lumiere. In the olden days they were called courting chairs. A man would sit on one side and the lady on the other, close enough to have that intimate tête-à-tête but far enough apart so that the chaperones couldn’t fuss! There is a pose menu in one seats for a male and in the other for a female. I love this style of chair, because it is so versatile, as you can use this in your garden, on your patio, or in your home. Actually it can be placed anywhere for a special moment with the one you care about! This also comes in a darker finish too! On the wall, you see two very nice Silver Horn Wall Sconces by Lumiere that adds just the right amount of glow upon the wall! To finish off the look, I added 2 nicely potted medium plants by Persnickety and a Ceawlin Texture Change Victorian Rug. 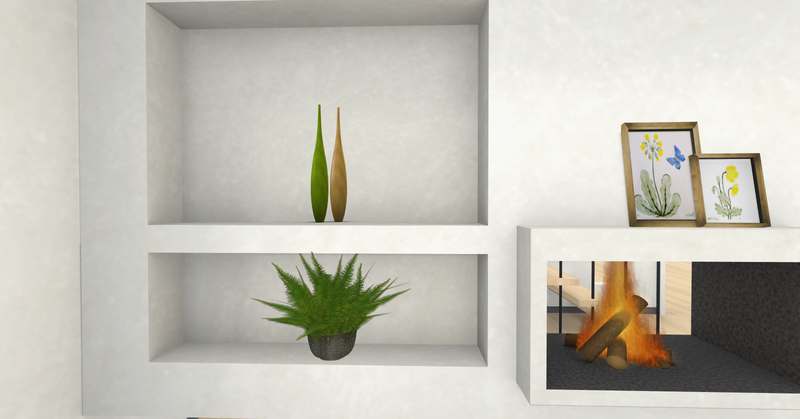 In the second Picture, you see a beautiful glass and gold base Leaf table and Leaf Lamp by Lumiere. it is the perfect accent table and lamp for any room. Here you see that I have placed it in the entry way and makes that area look welcoming and colorful! The rug is Ceawlin Texture Change Victorian Rug and the four pictures above are Tutti-Fruiti Pictures by LISP Bazaar . English Ivy in Antique Verdigris Teal Turquoise Planter by ETC. and 2 LISP Lilac and Mint Frames that completes this pretty scene. 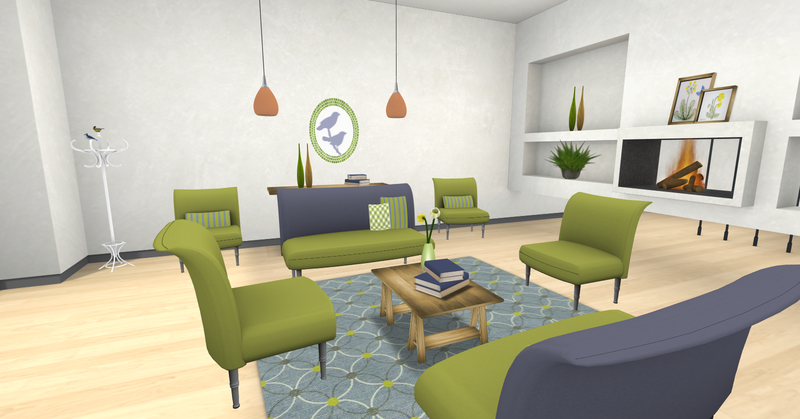 Kaerri’s beautiful Esplanade Living Room Set is available at the Love Donna Flora Event. It has a restful blend of blues and greens tones that invites you to come sit and stay a while. The furniture gives a soothing feel to the room. 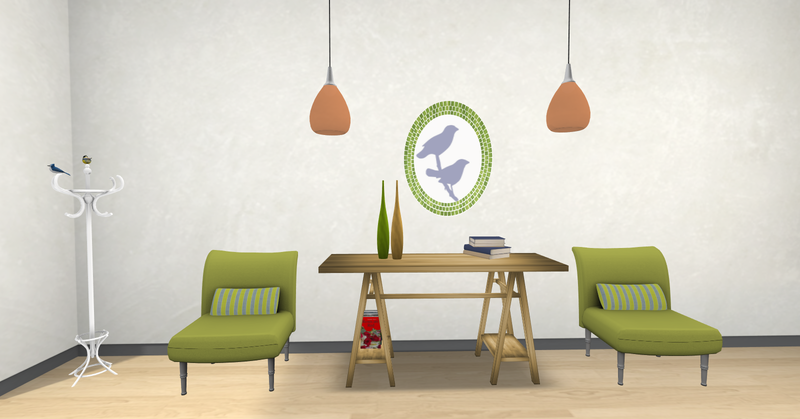 The set includes the couch, table, console, vase, table vase, 2 chairs, one with pillow, oval bird picture, 2 upright flower framed pictures, potted fern, coat rack, table books, and rugs. The set also has an excellent sit menu for the couch and chairs. I adore this color combination and love peeking into the room that I have this set up in. Color adds variety to our life and should be expressed in everything we do! The Love Donna Flora – A Fundraiser for Squinternet Larnia started July 25th and will run through August 11th. You never know what the next day will bring being human or pixel. Cherish all who you hold dear! As you traverse the world of second life remember we are all flesh and blood behind the avatar with all the frailties that is known to man. Live, learn, and love. In life, you get back what you give! Please lend your support by purchasing this beautiful set for Squinternet Larnia! Where is a bell boy when you need him and a fruity umbrella drink! I am all set to hit the sand in my VERO MODERO Bonnie Bikini in Red. This bikini is a 2 piece, strapless top, side round silver ring, flirty ruffled bottom suit. It also comes with this fabulous beach bag. You will be a total beach babe in this bikini! Oh well who needs a bell boy when you will have all the men following you in your Vero Modero Bonnie Bikini! This is a new pose set named Crystal! It is totally awesome and was created by the god of movement and grace, smiling, I love calling him that, PosESioN! Dahriel is such a very talented pose maker! I am using Crystal Pose 10.